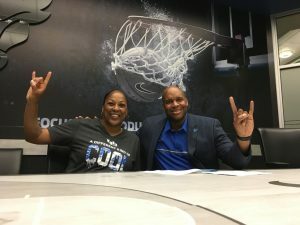 One of Buffalo’s best sports stories of 2018 got a lot better on Tuesday, when UB signed women’s basketball head coach Felisha Legette-Jack to a new five year contract. 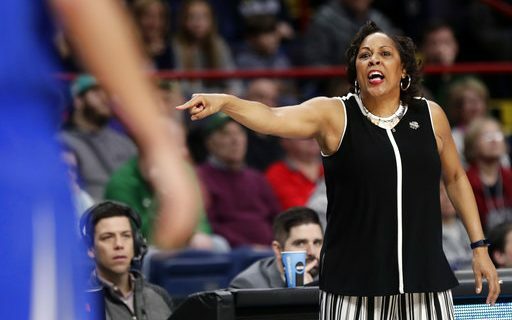 Beyond the significance of making Jack one of the highest paid women’s coaches in the Mid-American Conference, it was the symbolism of keeping her, and her desire to stay, that sent a clear message to Bulls fans and the entire WNY sports community. The new contracts given to Legette-Jack, and men’s coach Nate Oats in March, have moved Alumni Arena beyond the stepping stone location common to mid-major schools like UB. The commitment to higher salaries, increased budgets and improved facilities have made it more difficult for talented coaches to leave. A coach who always fought to make sure we could tell our story. Now you share yours. Buffalo is one lucky place to have such a phenomenal women leading the charge for the next 5 years! Can’t wait to watch this women’s basketball team rise to the top! Legette-Jack had plenty of reasons to stay, following the Bulls school record 29 wins and a captivating run to the Sweet 16. It become a feel-good story in Buffalo, as crowds grew in Alumni Arena and fans who never watched women’s basketball made the Bulls NCAA tournament games must-see TV. A native of Syracuse, Felisha had important reasons to stay. Her mom is battling Alzheimer’s and staying close to her was important. But equally as important was continuing to build the family and community she has established in Blue & White. “This is a hidden jewel….some real talent has come through Buffalo. It’s amazing…the academics, the community, Canalside, the football, the energy, the blue collar mindset. I can really make some things happen here,” said the program’s second-winningest women’s head coach. Legette-Jack’s contract was negotiated by new UB Athletic Director Mark Alnutt. According to sources, the annual salary of nearly $300,000 moves her near the top of the MAC’s women’s coaches in compensation. The contract includes bonus payments for team GPA, along with on-court successes like wins, tournament appearances and NCAA trips. Even though Alnutt has been on the job for a few months, he recognized that keeping Felisha was a priority. This comes a few months after Oat’s new deal (negotiated before Alnutt’s arrival) that will pay him around $600,000 a year, also near the top of the MAC. While Legette-Jack will have to replace five key players from last year’s team, including star point guard Stephanie Reid, she’s excited about six new recruits and returning star Cierra Dillard. The NCAA success, and now the commitment to the coach, will help recruiting and maintaining a level of success that has seen four straight 19 win seasons. Paul & Kevin Sylvester talked more about UB’s signing of Coach Jack in this week’s Sylvester & Peck On Sports podcast.